St Margaret's Convent at East Grinstead was founded in 1854 by John Mason Neale, an Anglican priest and leading figure in the mid-19th century Anglo-Catholic movement in England. As warden of Sackville College, East Grinstead, a seventeenth century for the care of old people, he became aware of the poverty and disease that existed in many ordinary homes in the area. Accordingly, he decided to setup up a Sisterhood of women, which adopted the name St Margaret's, to go out and provide nursing and other care. The first two sisters came to Sackville College at the end of 1854 to begin training for the work. In June 1856, the Sisters moved into a small house close to the College, with their number having risen to nine by the following September. Early in 1857, Neale's sister Elizabeth, who had charge of a small orphanage for girls at Brighton, went to join a community that was just starting in London, and she asked her brother if St Margaret's could take over the care of the children. He agreed and took a small house at the other end of the town where nine children were looked after by two Sisters. Neale himself took an active part in the care of the children, giving religious instruction on Sunday afternoons, taking them out for walks and picnics, and occasionally teaching them arithmetic or geography. Later that year, however, the fledgling order suffered a major setback. The daughter of an Anglican clergyman at Lewes joined the Sisterhood, much against her father's wishes. Two months later, Sister Amy, as she was now known, died from scarlet fever during an outbreak of the disease in the area. After it was discovered that her will included a £400 gift to St Margaret's, her father accused the order of having trapped Sister Amy, inducing to make the will, and then exposing her to the infection. His version of events was widely circulated in a pamphlet and in a number of newspapers. As a result, subscriptions and donations to the order virtually ceased, their landlord gave the Sisters notice to quit, and Neale earned the severe disapproval of the Bishop of Chichester. Undaunted, the Sisters continued their work and gradually regained the trust and support of the people in the area. In the summer of 1858, new premises were found in the shape of two houses connected to one another by a long shed. One of the houses was occupied as the Sisters' house, the other as the orphanage. A permanent home for St Margaret's took a major step forward on 20 July 1865 with the laying of the foundation stone for a new building at the north side of Moat Road, East Grinstead. The architect of the neo-Gothic design was George Edmund Street. However, because the construction was completed in stages over a number of years, Street's death meant that the plans were completed by his son Arthur. The official opening of the new premises, still far from complete, took place on St Margaret's Day (20 July), 1870. The orphanage section of the new buildings could accommodate up to 80 girls, aged under 14 at their date of admission. The girls were trained for domestic service. The order also operate a girls' school, known as St Agnes', and a training school for domestic servants at the site. The St Margaret's site is shown on the 1908 map below. 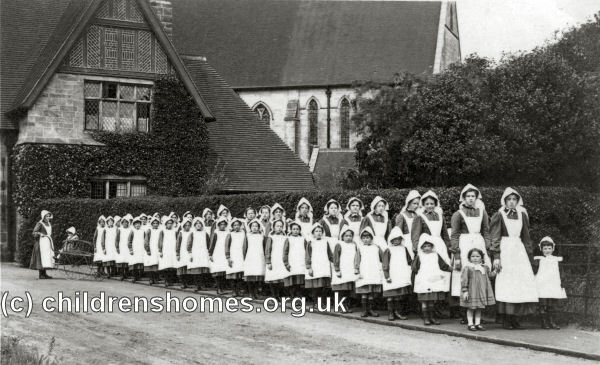 St Margaret's Orphanage for Girls site, East Grinstead, c.1908. 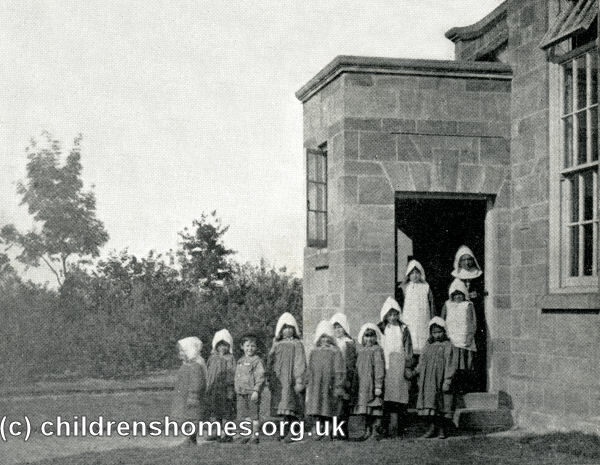 In 1890, the orphnage was described as bein for friendless or orphan girls of any age up to 14. At that date, an annual payment of £14 was requested for each girl, although this was reduced in some cases. Certificates of birth and baptism were required for each girl admitted, and inmates were sent to service at the age of 16. After the Second World War, the orphanage children began to attend local outside schools and the orphanage became more like a school hostel. 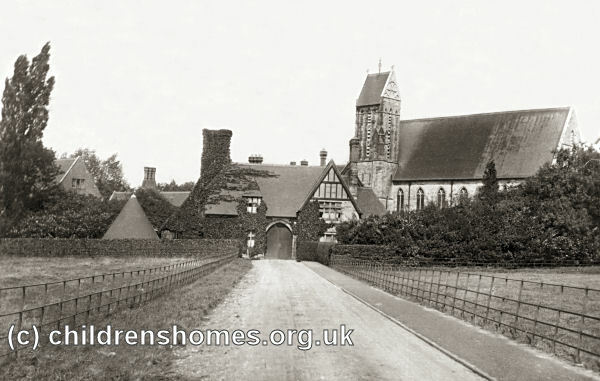 In 1965, the children transferred to the order's own school, by then known as St Agnes' and St Michael's, which now had its own building situated to the north of the convent. The old convent building has now been converted to private residential use. Doing the Impossible. A Short Historical Sketch of St Margaret's Convent, East Grinstead 1855-1980.